Eraser Dip Strip Chemical Pots can remove the insulation from virtually all magnet and enamel wires of all sizes and insulation types, including litz wire without damage to the wire. Remove oxidation and residue with the dip clean 2. Dip Strip does not corrode conductors as will acid strippers. The DSP stripping pots are designed specifically for use with Dip Strip. 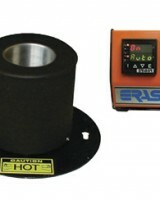 The standard model DSP1 has an infinitely variable temperature control with a reference scale. Dip Strip is used to chemically remove the insulation from virtually all magnet and enamel wires of all sizes and insulation types, without damage to the wire. When heated in the specially designed stripping pot, the Dip Strip melts and wires are immersed in the Dip Strip to strip the insulation. The stripped wires are then rinsed in water and Dip Clean Metal Cleaner to remove oxides and residue. Dip Strip does not corrode conductors as will acid strippers. Note: Contact Eraser’s Customer Service Department for shipping information. 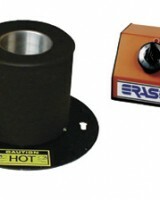 The DSP stripping pots are designed specifically for use with Dip Strip. The standard model DSP2 has an infinitely variable temperature control with a reference scale. Dip Strip is used to chemically remove the insulation from virtually all magnet and enamel wires of all sizes and insulation types, without damage to the wire. When heated in the specially designed stripping pot, the Dip Strip melts and wires are immersed in the Dip Strip to strip the insulation. The stripped wires are then rinsed in water and Dip Clean Metal Cleaner to remove oxides and residue. Dip Strip does not corrode conductors as will acid strippers. Note: Contact Eraser’s Customer Service Department for shipping information. The DSP stripping pots are designed specifically for use with Dip Strip. The DSP3 has an advanced feedback temperature controller and has a 600 watt heating element to increase the throughput 10 times. Dip Strip is used to chemically remove the insulation from virtually all magnet and enamel wires of all sizes and insulation types, without damage to the wire. When heated in the specially designed stripping pot, the Dip Strip melts and wires are immersed in the dip Strip to strip the insulation.The stripped wires are then rinsed in water and Dip Clean Metal Cleaner to remove oxides and residue. Dip Strip does not corrode conductors as will acid strippers. 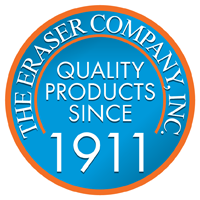 Note: Contact Eraser’s Customer Service Department for shipping information.